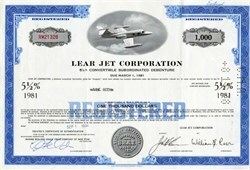 Beautifully engraved historic certificate from the Lear Jet Corporation issued in 1978. This is a very difficult to find 5 1/2% convertible Subordinated $1,000 Debenture. This document was printed by the Security Columbian Banknote Company and has an ornate border around it with a vignette of the world's first true business jet aircraft, the Lear Jet Model 23. When Lear came up with the idea for a non-commercial jet plane, everyone thought he was crazy. His first jet could only carry 2 passengers. This item has the printed signature of William Lear as President and is over 36 years old. The certificate shows the company name changes from Lear Jet Corporation to Lear Jet Industries to Gates Learjet Corporation. William Lear 1902 - 1978 was the founder Lear Jet Corporation which was the first mass-manufacturer of business jet aircraft in the world. Lear also developed the automobile radio, the eight-track stereo tape player for automobiles, and the miniature automatic pilot for aircraft. Born in Hannibal, Missouri, Lear attended public school in Chicago through the eighth grade. At age 16 he joined the Navy, where he learned radio electronics. Following World War I he took up flying. An early Lear design, a practical car radio, launched the Motorola Company. RCA purchased a radio amplifier design of Lear's, a universal unit usable in their entire line. Lear designed the eight-track player in the 1960s. Lear began designing navigational aids for aircraft In the 1930s and under the names Lear Corp. and LearAvia Corporation filled more than $100 million in defense orders during World War II. After the war, he developed a lightweight automatic pilot. 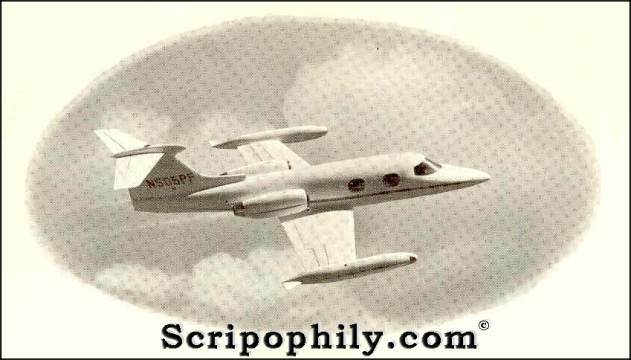 In 1962 he sold his interest in Lear, Inc. to form Learjet, which became the leading supplier of corporate jets within five years. After Learjet he devoted his energies to development of an antipollution steam engine. In the 1970s, his aircraft designs included the Canadair Challenger and the Lear Fan, an airplane built entirely from composites. Lear died during development of the Lear Fan, and although there were a number of advance orders it was never put into production.